We buy farm fresh eggs from a young girl in the country every week. Since Spring has sprung her little hens have been laying the most exquisite variety of colored eggs. It's hard to out do mother nature! Wow those are exquisite and look so beauitful as is, I think I would be hard pressed to change a good thing...and leave them as is. Just so pretty in their natural state!! Happy Easter!! Lovely just as they are. I agree with all of the above. Love them just as they are! Our neighbors in the wine country have chickens that lay pale blue eggs. it the natural route though and dyeing my eggs with the peels from a yellow onion. The eggs will be a burnt red. It's how the Armenians and Greeks have always done it. It is supposed to symbolize the blood of Christ. Purple cabbage turns them blue too. Your eggs look beautiful just the way they are... natural! We're lucky and get fresh eggs as well living in the country and aren't they the best? Happy Easter! 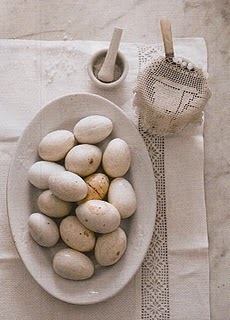 Love your little eggs... au naturel or dyed they are wonderful! Love love love these eggs Natural! Not to dye:) Have a Beautiful Easter with your beautiful family! I don't think I could bear to touch those beautiful eggs - they are so lovely. I would buy ones from the supermarket to dye!! These are sooooo beautiful! I love them in their natural state. Bet they are delicious as well. Lucky you to have these to cook every week! That is a beautiful photo Teri. I am in total agreement! Those eggs cannot be improved upon!